Success often depends on the connections you make. In our industry, people who get things done, get things going with the help of connections they make through MHI. Being part of the 2013 Spring Meetings provides an opportunity to network with your peers and learn from industry experts to make the connections you need to get your career and company going. Be sure to attend this year’s meetings to find out how you can take advantage of all the opportunities MHI has to offer. Meet the new MHI in a fun and interactive setting. Get ready for the most unique nightlife experience in the country! Howl at the Moon is the World’s Greatest Rock N’ Roll Dueling Piano Bar. Come sing, dance, and howl the night away as the most versatile and talented musicians perform your favorite songs from the 70's, 80's, 90's, and today on pianos, guitars, and more! Note: After 8:30pm the venue becomes open to the public and changes to cash bar. Jeffery will be talking about “What Every Executive Should Know about the US and the Global Economy.” Successful executives as well as investors must continually strive to learn and grow, especially given the increasingly competitive global economy and job market. Keeping up with, and then extending your command of, both the US and the global economy and financial markets is a must. This session aims to help you not only survive as an executive, but to thrive in the current and future volatile and globally competitive markets. Click here to download Jeff's Bio. 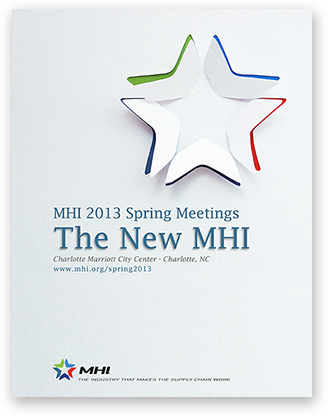 The 2013 Spring Meetings focus is all about you and your MHI membership. Attend both of the presentations (Monday and Tuesday) to learn more about the programs and tools available to you and your business. Topics will be presented each day in a brief and engaging format. Take good notes, you will have an opportunity to “play” what you have learned. Both MHI presentations will be hosted by Tyler Ryan. Tyler is an Anchor / Host on Good Day Columbia, airing weekday mornings on WACHFox television in Columbia, SC. He also is the morning voice for WXRY-FM, a free-lance writer for newspapers and publication throughout the south east, and professional spokesman/emcee. Click here to download Karen's Bio. MHI has reserved a block of rooms for April 7 - April 9, 2013 at the Charlotte Marriott City Center. The special room rate of $155, which includes in-room internet access, will be available until the group block is sold out or until Friday, March 22, 2013 -- whichever comes first. Book your reservation by calling: 1-704-333-9000. Mention that you will be attending the MHI Spring Meetings. Or you may make your reservations online. The Charlotte Marriott City Center location gives you walking distance access to the many attractions in Uptown Charlotte and offers you easy access to some of the Southeast’s most popular locales. The LYNX light rail takes you to even more city venues. The Marriott is located just 15 minutes from Charlotte Douglas International Airport (CLT) and within walking distance of Bank of America Stadium, home to the NFL’s Carolina Panthers, Time Warner Cable Arena, home of the NBA’s Charlotte Bobcats, North Carolina Blumenthal Performing Arts Center, the Levine Museum of the New South, Discovery Place science museum and IMAX Dome Theater, the NASCAR Hall of Fame, the Mint Museum of Craft and Design, art galleries and a variety of great restaurants. Click here to download the 2013 Spring Meetings brochure. Download will be a PDF. If you are paying by credit card, you can register by fax. Fax both REGISTRATION and EVENT SCHEDULE with your credit card information to MHI at 704-676-1199, Attn: Kay Clark. Download the complete MHI 2011 Spring Meetings Brochure. Complete and make payment for your registration by March 1, 2013, and save $100 off each attendee's registration. MHI has reserved a block of rooms for April 7 - 9, 2013 at the Charlotte Marriott City Center. The special room rate of $155, which includes in-room internet access, will be available until the group block is sold out or until Friday, March 22, 2013 -- whichever comes first. For answers to any registration questions, please contact Amy Cunningham, Member Services Assistant at 800-345-1815, 704-676-1190 ext. 8706, fax: 704-676-1199 or acunningham@mhi.org.